Thomas B. Allen's expertise in military history and strategy is combined with Roger MacBride Allen's knowledge of technology to reveal a lesser known yet fascinating side of the sixteenth president of the United States. Their authoritative narrative reveals Lincolnas our nation's first hands-on commander in chief, whose appreciation for thepower of technology plays a critical role in the North's Civil War victory overthe less developed South.We meet Lincoln as he exchanges vitaltelegraph messages with his generals in the field; we witness his inspection ofnew ship models at the navy yard; we view the president target shooting withthe designer of a new kind of rifle; and we follow Lincoln, the man of action,as he leads a daring raid to recapture Norfolk, Virginia. The book's historicsweep also sets Abraham Lincoln in the context of his military era: we learnabout the North's Anaconda Plan and the South's counter strategies and how theconcept of total war replaced the old Napoleonic way of fighting.Readers will come away with a rich sense of aleader who lived through one of the most exciting ages of technological andsocial change in America. 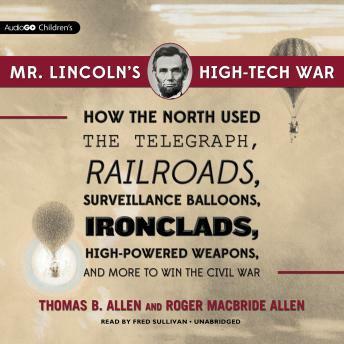 Mr. Lincoln'sHigh-Tech War brings alive a time when the railroad brought soldiers to andfrom the battlefields, when hot-air balloons were used for surveillance, andwhen ironclad warships revolutionized naval warfare.